One of the things that you learn on your Doctor Mom or Dad's knee is to be suspicious of stuff that don't quite sound right. There are any number of three card monte dealers on the street who would be only too glad to prove this to you in the lab. Tim Curtin, a Tim Lambert's favorite pinata, a guy so important that he has his own thread on Deltoid, has come up with a new one that he parked over at Honest Marohasy's Used Climate Argument Blog. The temperature data at Mauna Loa from 1955 do not support the conclusions of the paper, of extreme warming at ‘high altitude Hawaii” to the extent of 0.268 C per decade since 1975. 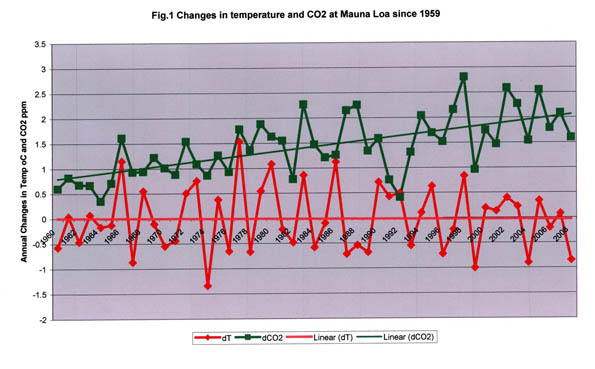 Actually as the graph shows there is a slight declining trend in the annual increases in temperatures at Mauna Loa. A plot of changes in temperature and carbon dioxide year on year from 1959, as in the chart, shows a steady rise in concentrations of carbon dioxide but no increase in temperature. I conclude that there is no relationship between carbon dioxide and temperature at a pristine site like that at Mauna Loa. In conclusion the whole theory of ‘radiative forcing’ allegedly arising from increasing concentration of carbon dioxide over time has no validity at pristine locations like Mauna Loa. So dear reader what's going on? Ah, very simple. The Curtin is not plotting temperatures, or temperature anomalies, but the CHANGE in annual temperatures. In other words, if the annual MLO temperature in 1975 was 4.5 C, and in 1976 it was 5.5 C, the CHANGE is 1.0 C.
Since CO2 concentrations are increasing approximately exponentially, and since the effect of CO2 on global temperature is approximately logarithmic, the net is that the annual CHANGE in temperature per year will be approximately constant. According to Tim Curtin's graph, at least at Mauna Loa, it is. a = 1 day missing, b = 2 days missing, c = 3 days, ..etc.., 2008 ranges from i to m in every single month. As the wascally wabbit sez, RTFR! Have to follow up on that. MLO observes the temperature regularly. They may not be reporting it to the USHCN. Mauna Loa does not appear among the 31 ICAO-designated reporting sites in Hawaii. There are, however, several COOP stations in the area, 1 of which has a period of record 1955-present, the quality control of which may be dubious. Not to belabor a point, this is why data analysis is done by actual scientists, not BS'ers on the web. FWIW, that station has also had several relocations, including a 58m increase in elevation from 1955 to 1957. There's something not quite right with his red graph because the mean value of dT over the 50 years data is .06 - even on their scale you should see that. This sort of stuff makes us honest Feynmannian denialists look bad. And the tolerance of it by McI and such (with brains) as sort of allied assistance is just SHAMEFUL. Let me repeat my wrong argument in more detail. William T pretty much said it all. Timmy left off the first, what, three years in the record he quotes. That makes him a very naughty boy indeed, but, as all bunnies know "Its OK if you are a denialist". which is what Timmy plotted. The value of a is the average increase in temperature each year and works out to ~0.03, again within the range predicted from the increase in CO2 concentration by Turcotte & Co. even if you leave out the first three years. Eli: I assume you are sincere but I did NOT as you claim "leave out the first 3 years". The Mauna Loa records of [CO2] began only in March 1958, thus 1959 was the first full year, and so to get dC/dt in 1960 I had to subtract 1959 from 1960. You have yet to explain why not a single so-called climate scientist including yourself ever thought to check [CO2] as at Mauna Loa against temperatures there or anywhere else including Stanford's Palo Alta. You seem to be incapable of computing a statistically significant growth rate for temperatures at Mauna Loa. The one you cite is not, even for the delinquent data you have used. The inconvenient truth is that you and all the rest (apart from the honorable few, eg Lindzen and Spencer) are perpetrating a fraud on a scale unimaginable even by Michael Mann and his soul mate Bernie Madoff. Which part of the difference between rate of change and acceleration do economists not understand (or ignore)? "why not a single so-called climate scientist including yourself ever thought to check [CO2] as at Mauna Loa against temperatures there"
Because we're talking about "global climate change", not "Mauna Loa climate change"? Brought to you by the Department of Simple Answers to Seemingly Complex Questions. "a fraud on a scale unimaginable even by Michael Mann and his soul mate Bernie Madoff." Therefore, the person guilty of ad hominem attacks is not Tim Curtin, but Eli Rabett. Woohoo! By fitting the change rate (of CO2 or temperature) to a straight line, Curtin is effectively fitting the original measurement to a quadratic curve. Mr Curtin, either are the one perpetrating a fraud or you are making a sophomoric error in basic science. By plotting the rate of change of T and CO2 you show that you are getting a linear increase in T for a quadratic increase in CO2. Real scientists understand what they are looking at whereas you have misinterpreted the graph as showing no dependance! In the US in the first weeks of HS Physics class students are taught how to interpret graphs like that. By the way over the small range that you have plotted over a quadratic is a good approximation to an exponential which is exactly what would be expected from the radiative forcing of CO2. So it appears that you have demonstrated the validity of radiative forcing by CO2, congratulations! As bi noted, no climate scientist has thought to make such a plot because climate scientists actually understand climate science. In particular, they know that the troposphere is strongly coupled and hence that the pattern of warming is dominated by those couplings and not by the pattern of radiative forcing. And, they also know that the statistics on temperature trends from a single observing station are not all that good. I am glad that you are at least beginning to understand that there is a difference between how you approach these issues and how real scientists approach it. That is progress. Additional progress would be to the much-deserved humility to realize that their approach might be better than yours, but that is probably too much for ask to ask for? Extreme ignorance and arrogance seem to go hand-in-hand. Apparently TC's computer skills are as sharp as his data analysis. Beg to differ CapitalClimate. His computer skills are far sharper than his data analysis. This may be part of Google's not so subtle drive to use Blogger as a truncheon. I tried using my Google identity but still no sign of Paste button in this area. Never mind. Just to say I see no evidence that using a quadratic produces R2 of any more significance of CO2 for T than for a linear regression. More generally, why it is that even when expressing its 90% or 95% certainty on any issue the IPCC's AR4 WG1 never presents its regression results themselves (eg at p.671) with no mnetion of coeffecienmts, omitted variables, auto-correlation efefcts, or anything else one would espect to find when such statements are made. David Karoly was Review editor of that Ch.9, and apart from ensuring at least 8 of his own papers were cited, in none of which are there any regression results at all, let alone just one that would justify his own endorsed "extremely likely (95%) certainty" that GHG "have exerted a substantial warming influence over that period". Substantial must mean more than 50% of total warming if it means anything, but to take Brisbane Aero's mean min, [CO2] in quadratic form explain less than ONE percent of "the warming" (actually cooling relative to [CO2] in quads after 350 ppm was reached). I will gladly supply my Excel to any here who might be interested in real data analysis rather than the fictions of AR4 WG1. Tim Curtin. This (or something so similar as to be technically speaking identical) has been pointed out to you before on Deltoid IIRC. You have at least a 2-button mouse. The RH button (unless you've remapped it) is usually context sensitive. Highlight the text you want to copy, right click and choose Copy (or just use CTRL+C from the keyboard) and then paste into the comment box with CTRL+V or the RH mouse button's Paste command. which was done with a combination of those methods just and previously explained. What's so difficult? It is possible for websites to request that the browsers turn off functionality (eg disable right-click), but the browser can ignore such requests (eg as the result of some ffx add-ons). Blogger allows the comment form to be one of three formats: in-line with the post, separate full page or pop-up window. The Rabett has his set as pop-up window, others (eg MT) have different settings, thus the different behaviours across different Blogger blogs. For people who don't like pop-up windows, right-clicking on the "comments" link and selecting "Open in a new tab" will open the relevant page in a full page tab within the current browser window. This only works with browsers that support tabbing, obviously. NOTE, I have so many FFx add-ons that I never quite know what's default behaviour any more. So what you see may vary. Huh. Upgrade to Linux, select, and paste by middle mouse. Huh! Subscribe to Disney and select, copy and paste by Mickey Mouse. Mr Curtin from your remarks in response to my comments it seems that you haven't done calculus? Please note that I use the raw data on T and [CO2] for both graphs and regressions. Unfortunately, T does not increase linearly at a constant rate, despite what you and the IPCC say, and neither does the rate of change of dCO2. Otherwise what you say is fine but not relevant empirically. You said “When the rate of change in temperature, dT, is constant it means that T increases linearly at a constant rate.” Sure, but on the data I see the rates of change in Temperature, dT, vary from place to place and do NOT increase linearly at a constant rate, as you would see if you computed the year on year rates of change, despite the universality of the atmospheric CO2 concentration and its alleged quadratic rate of growth. Moreover, the average rates of change of T at Los Angeles and Canberra Airports from 1959 to 2008 were 0.01885% p.a. and 0.37563% p.a. respectively, so Canberra’s was no less than 18.89 times faster than LA’s! However my local knowledge, confirmed in a paper by Clem Davies at ANU, is that the major expansion of Canberra’s airport and its environs since 2000 (it was previously in a rural setting but has become a major urban centre in its own right) has led to a divergence between T at the airport and T as measured in nearby suburbs. This suggests that something other than CO2 played a part. But that does not stop the Australian Bureau of Meteorology solemnly reporting Canberra Airport to NOAA/GISS as representative of the city as a whole. “ When the rate of change in a variable, in this case dCO2, increases linearly it means that the variable increases as a quadratic function”. But does it? No. Just try computing the first and second derivatives of the year on year annual changes in the level of atmospheric CO2 concentration at Mauna Loa, and see what you get. If you get a linear 2nd derivative, then pigs have wings. Moreover while there is a positive trend in the 1st derivative, that of the second derivative is NEGATIVE. So Philip, what is your point re the actual [CO2] and T data at Mauna Loa or anywhere else? Help!! there's too much noise in the data! I can't fit a line anywhere! It's going all over the place! Two different measurement stations are not the same! They were even more positive than Mauna Loa! What's wrong with the data, it goes up wherever I look! The more derivatives I take the noisier the data gets! Someone get me out of here! Help!!! William T. You are right. All data on [CO2] vis a vis temperatures is NOISE, as the really important influences, which are led by human energy usage, are ignored, above all in AR4, Wg1, chap. 9. Gratifying to see no contrarian comments on my recent posts here from Joel, Phil & Co.
1. If the Stern (2007), Garnaut (2008) and Hansen 2008 recommendations for anthropogenic emission reduction targets are adopted at Copenhagen (December 2009) and globally implemented, they will reduce emissions below the growing level of photosynthetic uptakes, and are then likely to lead to the large reductions in agricultural, forestry, and fishery productivity indicated both by my regression results above and by Cline (2007). This will certainly cause more immediate hardship to more people than the as yet non-evident “dangerous” climate change asserted in the advocacy of the IPCC WG1 (Solomon et al. 2007). 2. It follows that emission reduction targets should take into account terrestrial and oceanic uptakes of CO2, which have for 50 years absorbed more than half of global CO2 emissions. That means such targets should never reduce emissions to below either the current or the ongoing level of such global absorption of CO2. 3. Given that the average level of annual net new global biospheric absorption of anthropogenic emissions has been 57% since 1958, which means that net emissions have been only 43% on average, that in turn means the likely Copenhagen target of a 60% reduction by 2050 in total emissions from the 2000 level is already being over-fulfilled. 4. The dangerous fallacy in the Copenhagen targeting is the false belief that reducing total emissions by 60% from the 2000 level will have NO impact on the annual new biospheric absorption, which embodies incremental global NPP, i.e. yields and output of all food crops, livestock, forestry, and fisheries (Lloyd and Farquhar 1996, 2008). 5. The IPCC’s reliance on models (notably Wigley’s MAGICC) based on the Michaelis-Menten function, forces its projections of the atmospheric concentration of CO2 (i.e. [CO2]) to produce a continuous increase to nearly 500 ppm by 2050, and 780 ppm or 1000 ppm by 2100 if not before (Solomon et al. 2007:Fig.10.20). My observationally based parameter yields much more plausible levels that might just reach 450 ppm by 2050 and 562 ppm by 2100 (projecting from end-2008 at the observed growth rate of 0.41% p.a. from 1958 to 2008). The behaviour of the CO2 emissions absorption function will be of the form (1-e-ax), an inverse exponential asymptote, rather than the logarithmic (growth slows down) as used by the Bern models, and the hyperbolic (growth ceases) of the MAGICC models; neither of the latter is supported by observations of the growth of absorption of the total global CO2 sink since 1958. 6. The crucial implication of this paper’s findings for the negotiators who will assemble at Copenhagen in December 2009 is that they should grasp the moral imperative of NOT trying to get the world to abandon cheap fossil fuel energy in favour of uneconomic renewable and other sources, and instead devoting all our resources to raising natural absorption of CO2, for example by helping African and SE Asian countries to raise their cereal yields to North American and European norms. That will not only be cheaper than seeking such will o’ the wisps as Carbon Capture and Storage (CCS), it will have tangible financial benefits, unlike CCS and the like.